Now a day’s VoIP (Voice Over Internet protocol) is going to change our internet experience by providing free calling facility all over the world by just using internet.. But what if I tell you the trick by which you can make calls from free internet to mobile phones..? STEP 1: Install Yahoo Messenger..if You don’t have Yahoo Messenger On Your Pc Then Follow This Download Link And Download The Latest Version. STEP 2: Sign In to Your Yahoo Messenger By Using Your Yahoo Id And Password. STEP 3: Configure Your MIC or Headphone In Yahoo Messenger.. 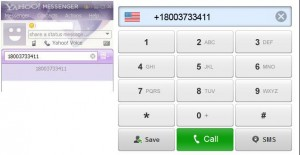 STEP 4: Inside Your Yahoo Messenger dial +18003733411 ..As You Can See In Image Below.. STEP 5: After That An operator greets you with a recorded welcome message along with an advertisement and asks you to select one of the Free411 service. Just hear the services options until they say the last one as “Free Call”. When you hear this, don’t press any number on your keyboard and instead SAY “Free call” loudly on your microphone connected to your PC. After this voice message is detected by their System, they will run a short advertisement of their sponsor Don’t Press Any Number At That Time..
Now Your Call Will Be Connected And You Can Call 7 Continuous minutes For Free..
After Disconnected…Repeat The Same Procedure Again..You Can Able To make Multiple and Unlimited Calls By Using This Trick...you Can Also make International Calls By Using This Trick..